director of The Incredibles takes your family on an action-packed thrill ride. Join former boy genius Frank (George Clooney), optimistic, science-minded teen Casey (Britt Robertson), mysterious Athena (Raffey Cassidy)and the brilliant David Nix (Hugh Laurie) in a world of pure Disney imagination. Tomorrowland transports you on an inspiring and magicaljourney of wonder and adventure to a place where if you can dream it, you can do it." 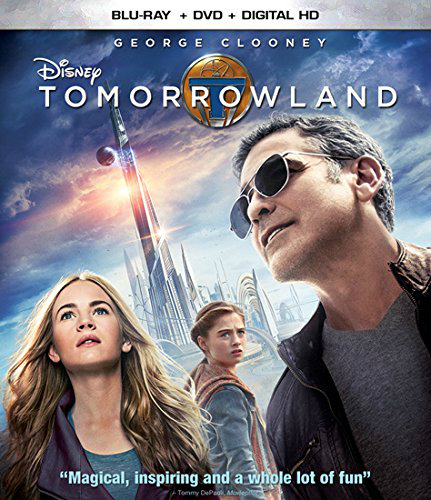 As a Disney loving family, we were all really excited when a copy of Tomorrowland showed up for us to watch and review. We sat down as a family to watch the movie, and while I wish I could say we all loved it, that is just not the case. The visuals of the movie are stunning, and I am a fan of George Clooney, so it was great to see him in a little bit of a different role than what he normally plays. In terms of the actual movie though, I just found it didn't really ever GET anywhere. Mr. J seemed to enjoy it, but he didn't understand a lot of what was happening; Mr. K wasn't really interested after the first 30 minutes or so. If you are a Disney loving dreamer, then it may appeal to you. Tales of Mommyhood received the above mentioned product in exchange for this post. All opinions are honest and belong to Tales of Mommyhood. Your opinion/experience may vary. I heard wonderful things about this movie and can't wait to see it! This movie is on my to watch list; love Disney movies! I heard very mixed reviews about the movie.... Now that it's on Netflix, we'll have to sit down and watch it.